The Portland Winterhawks' first three-game weekend of the Western Hockey League season was a lost weekend. Kamloops scored its second win in as many nights at Memorial Coliseum on Sunday, beating Portland, 5-2. The Winterhawks lost all three games they played this weekend. At 7-6-0-1 (15 points), Portland has fallen to fifth place in the U.S. Division. Kamloops (6-6-0-1, 13) won three road games this weekend and is third in the B.C. Division. 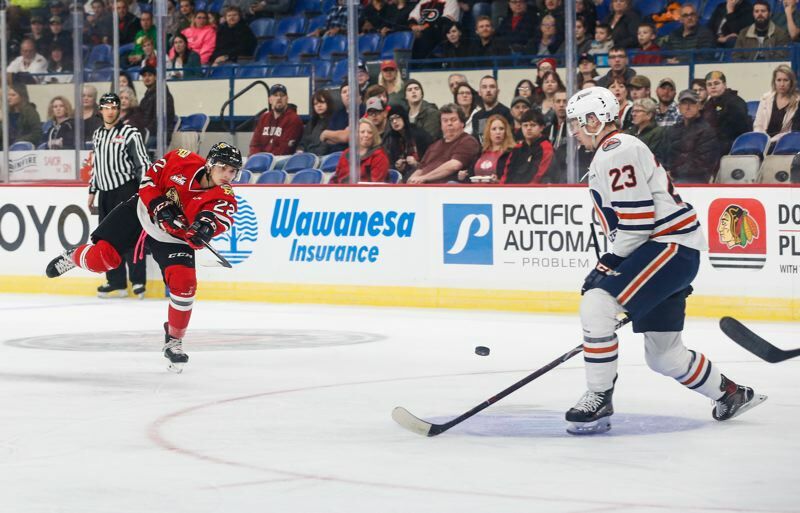 Cody Glass scored his fifth goal of the season, and Ryan Hughes scored his fourth, but the Winterhawks' offense struggled to generate quality scoring chances. Kamloops scored two second-period goals to take command. Both Portland goals came on the power play. Glass banked a shot-pass off of the skate of a Kamloops defenseman 2:36 into the third period to pull the Winterhawks within 3-1. Hughes scored on a snap shot through traffic with 1:10 left in the game to pull Portland within 4-2. That goal came with Portland skating six-on-four and goalie Shane Farkas pulled for an extra attacker. Hughes and Glass each assisted on the other's goal. Portland was 2 for 5 on the power play. Kamloops finished 1 for 7 on the power play. The Hawks were shorthanded six times over the first two periods. The game was scoreless until Josh Pillar scored 7:14 into the second period on a shot from low in the left-wing circle over Farkas 'shoulder. Kobe Mohr made the score 2-0 at 11:46 of the second. Carson Denomie skated up the right wing and centered the puck to Mohr in the high slot. A power-play goal from defenseman Montana Onyebuchi made it a 3-0 Blazers lead 1:56 into the third period. After the Glass goal gave Portland some life, Orrin Centazzo won the puck near his defensive blue line and scored a breakaway goal for Kamloops at 7:45 of the third period. Each team had 34 shots on goal. Farkas made 29 saves. Kamloops goalie Dylan Garand had 32 saves. The Winterhawks have another three-game weekend coming up. Victoria visits for games at 7 p.m. Friday at Moda Center and 6 p.m. Saturday at Memorial Coliseum. Portland visits Spokane next Sunday.